Is your fence moldy? You can safely and effectively clean it yourself to increase its longevity and freshen its appearance! Wood fences are beautiful and classic. Unfortunately, wood fences are also prone to mold, insect infestation, and rotting. 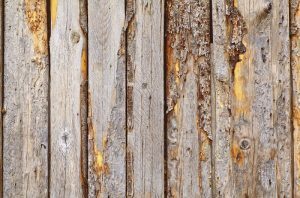 Removing mold from your wood fence is not an incredibly difficult process, especially if you’re an experienced DIY-er. Here are our best tips for removing mold from your wood fence. Mix ½ a cup of white vinegar into a gallon of water. Apply the solution and let it soak on the wood for about 15 minutes. Rinse thoroughly. Mix ¼ cup of bleach and ¼ cup of laundry detergent into a gallon of water. Use this solution in your pressure washer to get stubborn mold patches off of the wood fence. Use an over the counter wood fence or deck cleaner to get the mold off. These are typically mixed with water and applied with a sponge or scrub brush. Some products are designed for lazy homeowners so that all you need to do is add the mixture to a sprayer, spray it along the length of your wood fence, and leave it! These work by killing mildew and mold on the surface over time to restore your fence back to new. If you are struggling to remove mold from your wood fence or needing other repairs completed, call in the professionals. They know the best methods for removal and will work hard to protect the investment you made in your fence. If you don’t want to DIY and take a risk, call in the pros from Hercules Fence! This entry was posted on Friday, March 24th, 2017 at 9:33 am. Both comments and pings are currently closed.